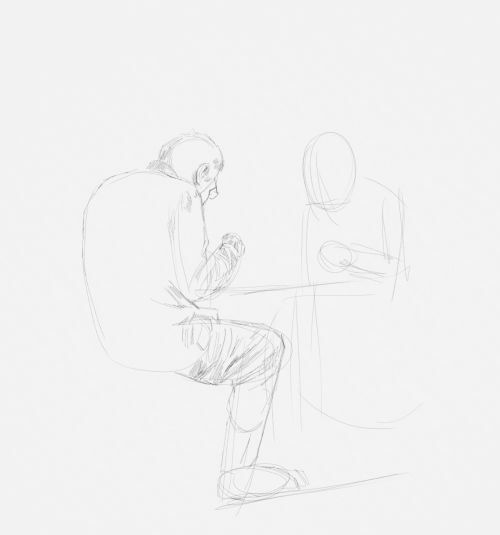 These people sketches can help you learn to sketch on the spot enabling you to make drawings of people that are useful in developing more detailed works of art. 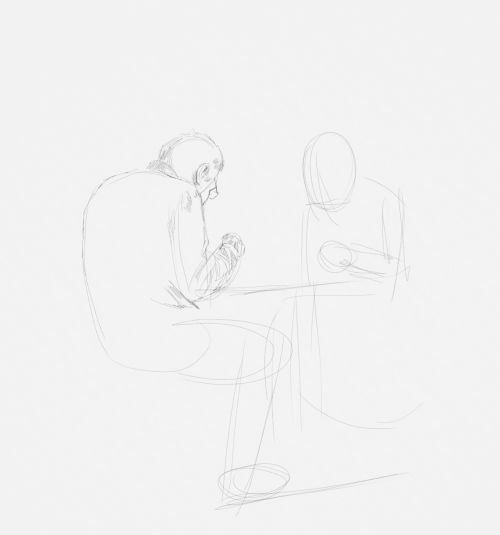 Take the opportunity to sketch from life whenever possible. Even if this is new to you it is worth getting over the fear of drawing on the spot. Sketching means anything from detailed drawings to rapid scribbles. If you are going to draw a tree you have time to study it, time to make mistakes and correct them. People sketches are different. Unless you get someone to pose, mostly you will be quickly trying to get information down on paper. The truth is the more you do it the better you will be. We all know that. 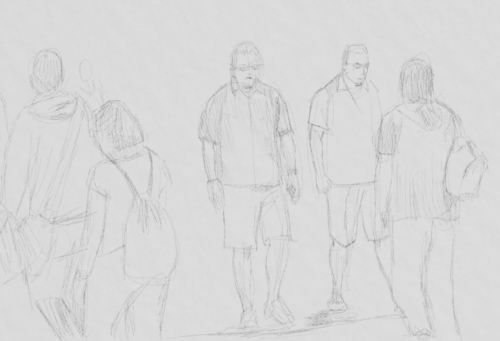 You can help yourself by going where people are settled before attempting really speedy drawings of people who are simply walking by. 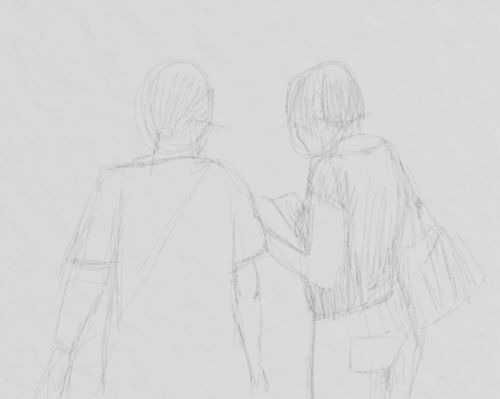 Sketch in cafes, pubs, parks, bus stations and if you ride on public transport utilize this time. From there move onto places where people gather to watch something. 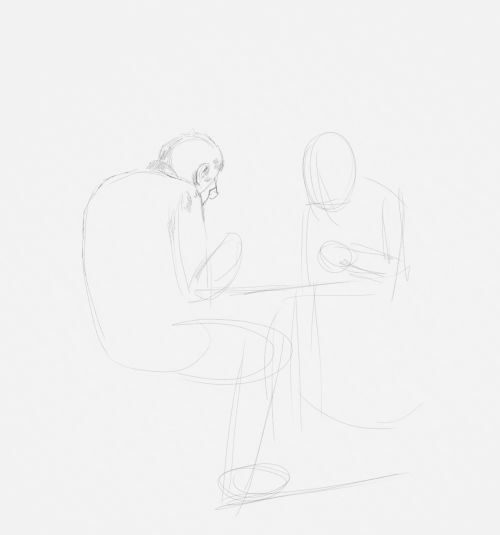 I have an older tutorial on sketches of people here where I offer some general advice on this. 1. 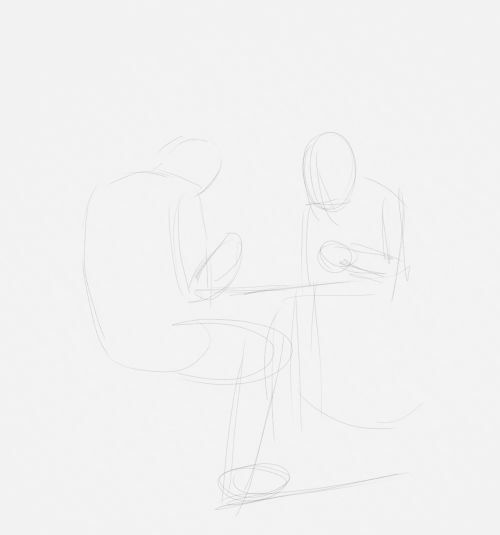 Here I am reproducing a sketch I made while having a meal. An elderly couple were sat far away enough from me to avoid any embarrassment. I started with the head of the man. A quick curve took in his bowed head and beginning of his back area. 2. Arm which is two tubes. 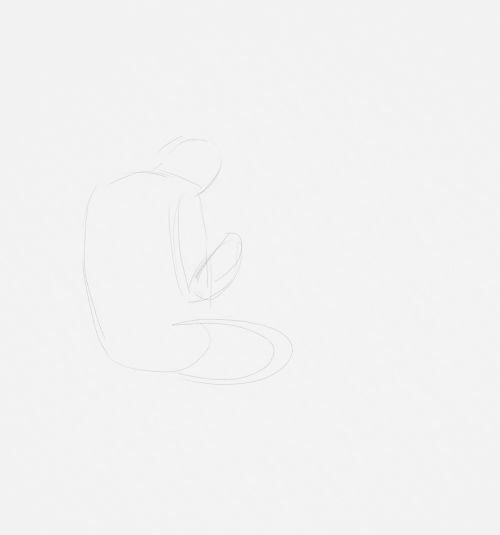 What I'm doing is getting the position of the various body parts and how they relate to one another. 4. The table and line below showing the angle. 5. I used the same method for the woman. 6. Now I've got the basics I start drawing the man's face. 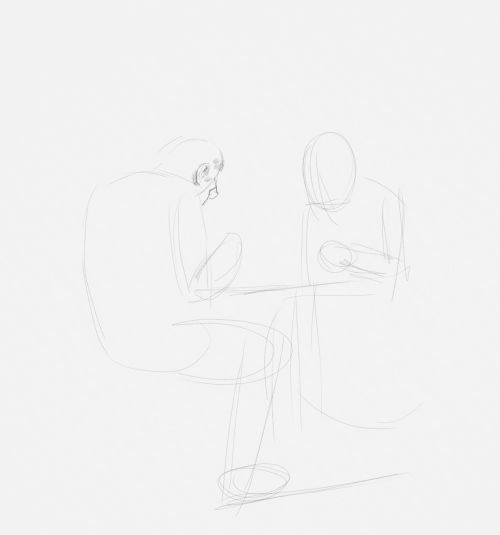 I start with the ear move onto the edge of the face and then sketch his glasses. 7. 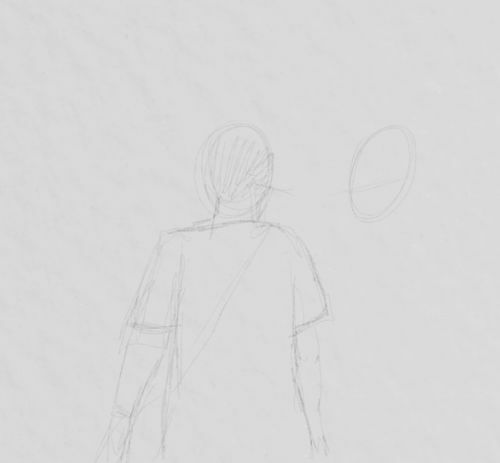 It is easy to draw in the hair and clothing because the angles are already worked out. 8. 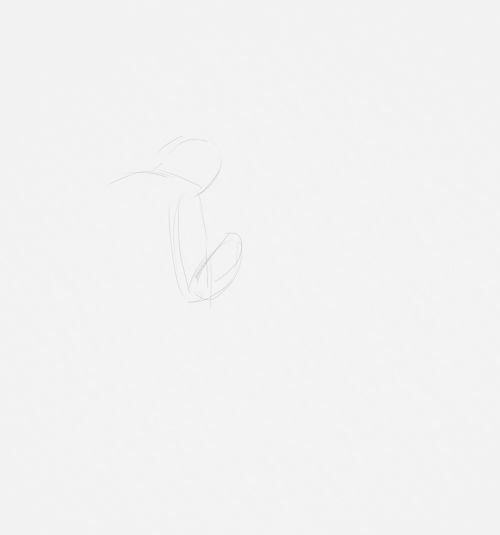 I draw the arm and leg mainly concentrating of the folds in the clothing. 9. I sketch details on the woman and draw her fork. Little incidentals like this show us exactly what the couple are doing. 10. I draw in more incidental details. 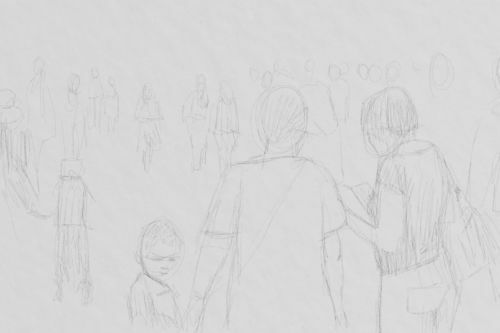 Although the sketch isn't complete there is enough information in it to show the observer what is going on. This is a reproduced sketch. The original was done from life. This is an attempt to recreate how I did it. 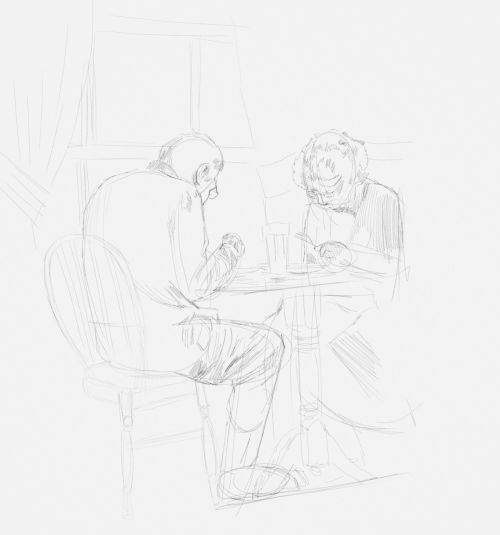 I worked at the same speed except for scanning the sketch between stages. The second drawing is more difficult. 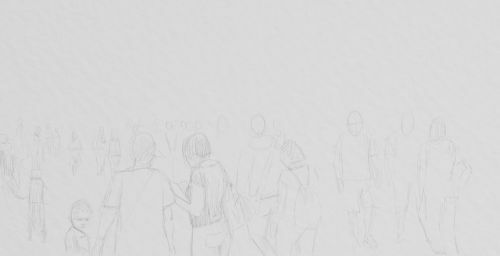 Although there is little detail the fact that the people were mostly moving makes the task a little harder. My advice is get some distance between yourself and the subjects. 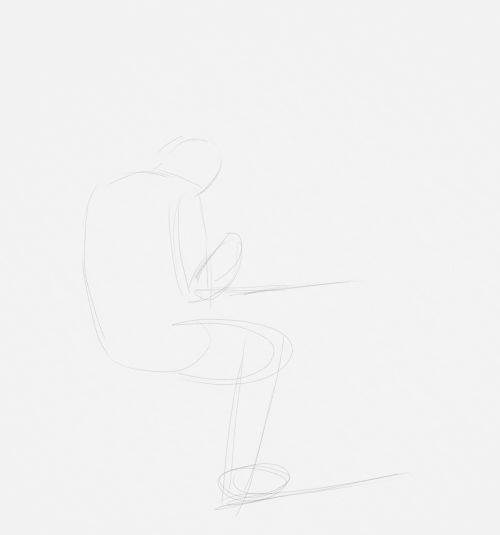 The more distance you can give yourself the more time you have to make the sketch. 1. 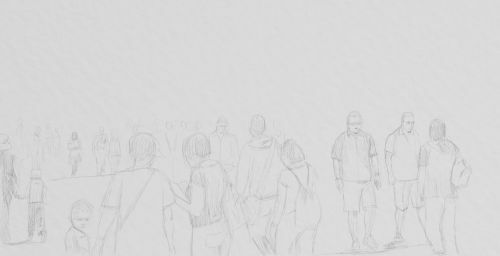 The first thing I did was decide to place a small group of people in the foreground. 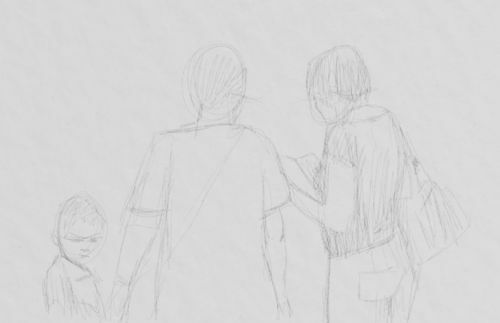 I would use their size as a guide when sketching in people who were further away. I waited a while until I saw two woman and a child pause. I very quickly drew the first woman. What I tend to do is scribble gently on the paper barely lifting the tip off the surface. I also spend more time looking at the subject and only glance down to check my progress. Try this for yourself. I draw an oval to show me where the second figure lay. 2. I draw the second woman concentrating on the body and clothing. 3. Her hair and side of the face. 4. I sketch the child. The main thing was his height and face. The fact that I caught him looking back is a bonus. 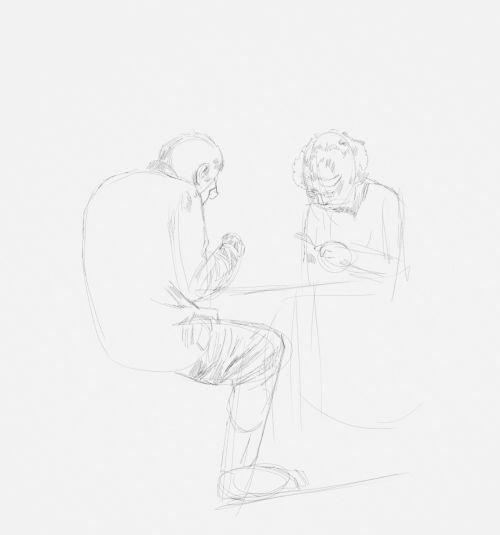 Actually capturing behaviours in my people sketches rather than only forms is a delight and will always lift a drawing. 5.  Now I have a lynchpin in terms of scale and detail I can add figures across the drawing. You can see how simple the figures are at this stage. Simple shapes and lines. 6. Now I add a few spare details to the figures. Some I make up others are added by looking at other people and adding their details to the group of figures. Adding a few shadows also adds credibility to the piece. Here is the drawing in two halves. 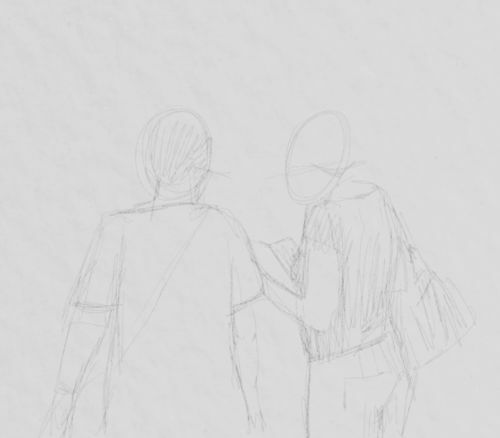 Try both methods of drawing pencil sketches. The second one is really effective and helped me to improve over the years. 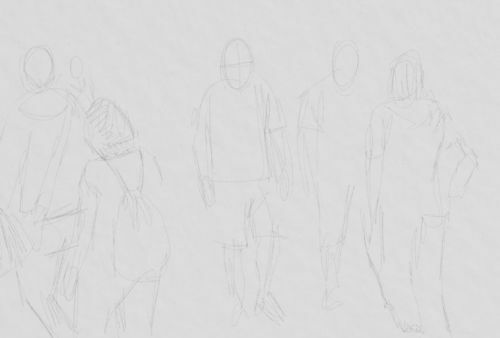 Go to drawing people from people sketches. 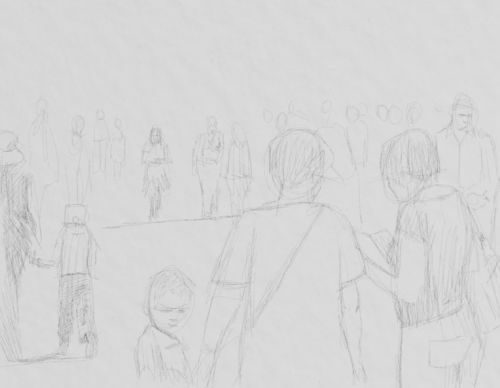 Add your people sketches to the site by following the above link and scrolling to the bottom of the page for instructions.